KayKiSpeaks.com: Love It! Dwyane Wade's 1 on 1 Game With 90 yr. old Grandma Nelly Made Me Cry! Love It! 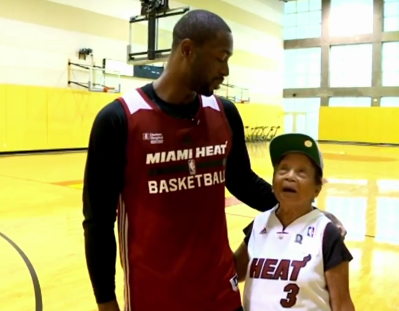 Dwyane Wade's 1 on 1 Game With 90 yr. old Grandma Nelly Made Me Cry! Yall, this is the most beautiful thing I've seen all week. I cried. 90 yr. old Illuminada Magtoto "Grandma Nelly" is a huge fan of Wade and the Heat. Just before turning 90, she posted the cutest video challenging one of the most known basketball players to a one on one game. Dwyane Wade accepted her challenge, and Grandma Nelly spent some time at the Heat's practice facility throwing the ball around a bit with Wade. Literally this is the cutest thing ever. It was obviously a very emotional moment for both of them. Grandma Nelly had a strong toss to the basket. When Wade assisted one of her attempts with a slam dunk, he told her she was better than his teammate Mario Chalmers! Grandma Nelly for Point guard!!!!! Grandma Nelly is so vibrant and adorable at 90. She's proof that dreams can always come true. God bless Wade for taking the time to do this, and God bless Grandma Nelly!